Well what a month October has turned out to be! We thought we would move to Taupo and just take a few weeks for the boy to recover from heart surgery, do a bit of exploring and ease our way in to our new life in Taupo. Someone bigger than us has had very different ideas. This blog is all about making a few announcements that I have been sitting on for a while and it seems timely that as all things come together for good, I can now share some exciting news with my readers. 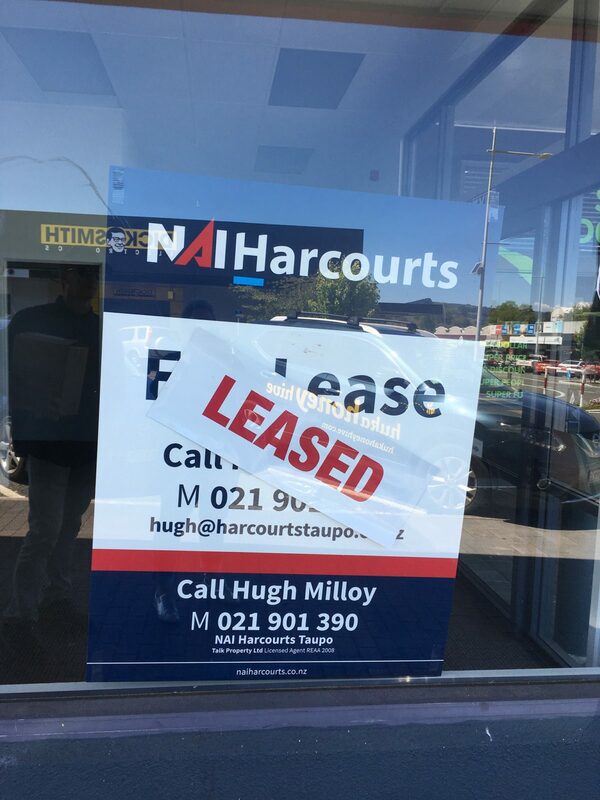 We had been in Taupo 5 days when I had a call from my Real Estate agent, advising that a property had just come up for lease and it wouldn’t last long. He strongly advised that we should look at it as soon as possible. Bearing in mind that our ‘patient’ was still in recovery mode and requiring 2 or 3 sleeps a day (just like a new born baby), we had to find a time when he wasn’t likely to be sleeping, to check this building out. To be perfectly honest, I really only said yes to the agent to get him off my back. Well, I sure got that wrong. As soon as we walked into this building, we just KNEW that it was the right spot for us. The right spot for The Eye Of A Needle to have a shop. We wanted to be in or near the CBD, but we didn’t want to pay an excessive lease in our first year in business. We had been advised that we should look for a location with good foot traffic. The holiday season in Taupo can be pretty crazy and we figured if people are out wandering the shops, we want to be easily found. Another important factor was good parking – well we have that too. I am delighted to announce that The Eye Of A Needle Limited has signed a lease on a property located at 30 Tamamutu Street in Taupo, and we take over that lease on December 1st, 2017. It’s not like the last couple of weeks hadn’t been busy enough with moving house and one of us in hospital having bypass surgery. But, after consultations with lawyers and the council to make sure everything was legit, we signed on the line and now we are going to have our very own shop. I have also been holding out on releasing another piece of news, and today feels like the right day to tell you that we have also secured the dealership for BERNINA Sewing Machine Sales & Servicing for the Taupo region. When we first looked at moving to Taupo I sent off an email to Bernina asking if there was any chance of having their business here. I knew there had been an existing business that had closed several years earlier, and after doing a bit of research and talking with their CEO, we arranged to meet the following week. By the time I had finished my cappuccino, we had pretty much been handed the Taupo dealership on a plate. We have learned that when doors like this open, it is basically confirmation that we are on the right track, so again, after seeking legal advice and signing the dealership with Bernina, we are delighted to say that we will be stocking, selling and fixing Bernina sewing machines in our new shop. YAY! Since all these deals have been confirmed, I have really had to get my skates on and get a bit organised. I’ve been ordering beautiful fabrics, sourcing sewing accessories, contacting suppliers, getting business cards and letterheads printed, drawing up an inventory for the online shop, and finding my way around Taupo. When you move to a new town you need to find out where your favourite shops are. Things like finding a new hairdresser, someone to do my nails, courier services, the Post Office, good vege shops and a decent butcher to name a few. And of course, now we need tables and chairs so I can run classes in the shop, and we need more props! We have a good amount of space in our new shop for all the things I have dreamed about for years, so it’s pulling it all together now to make that dream a reality. I am also having a crash course with VEND, which is what merchants use to sell things, XERO, which is an accounting programme, GST, scanning, barcodes and eftpos machines. There are so many new words and programmes to grasp hold of. Every day there seems to be a smorgasbord of information and emails in my inbox with quotes for one thing or another. We have 6 weeks to get sorted before we take over the lease, and we also need to take a week to train with Bernina in Lower Hutt, as well as meeting with many of our potential suppliers who are based in Auckland. All I can say is that obviously God thinks we are ready for the challenge, and as long as we keep our eyes on Him, He will give us strength for the job and the WISDOM to know how to do it. So it’s all systems on go – full steam ahead. Our patient is making a great recovery even though driving is not allowed for 6 weeks post surgery. He’s doing all the right things most of the time, and learning good lessons when he doesn’t. And I am learning that I can’t do everything…I had a bit of a reality check when I ended up at the chiropractor this morning! Clearly the body has said I need to slow down slightly, so I am taking the hint today and taking things a bit easy. What fantastic news Kay. Congratulations to you both. I pray that David has a speedy recovery, and you take care. Love the name. Can’t wait to come and visit. Blessings to you both.